This 70s reproduction blouse beautifully combines a large array of colors which are not quite as bright as they appear above, just a bit deeper. The fuchsia, the mauve, the reddish pink, the russet and the purple blend and merge together resulting in a mauve and coral impression. The individual colors don't really stand out, although the paisley like swirls and florettes do displaying a very lively pattern. 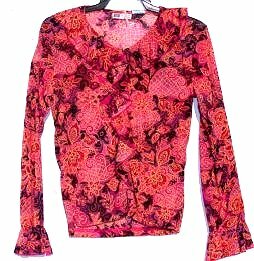 The blouse is made out of a very thin very stretchy polyester that is extremely lightweight. The scoop neck is outlined with a delicate ruffle that travels down the center of the blouse as well. The sleeves are loose fitting, but not belled and possess a ruffle at the ends as well. They are full length. The overall impression of the blouse is a mauve and coral blend, but since it actually possesses so many colors, it should be able to match all kinds of things. Of course it would probably match solid black the best. The blouse is approximately a size 6/7. It would best fit a 34-36" chest, although it stretches very easily able to accommodate a 38" one as well. I have some black ultrasuede 60s style miniskirts that are made of circles of fabric hooked or crocheted together with a liner underneath that are really great looking and would match this. They are simply hard to photograph being solid black. Email if size desired.